Strathmore is a suburb of Melbourne, Victoria, Australia and is situated approximately 11 km north-west of Melbourne's central business district. Strathmore is part of the City of Moonee Valley local government area. At the 2016 Census, Strathmore had a population of 8,419. Strathmore is bordered by Woodland Street to the south, Bulla Road and Essendon Airport in the west, and the Moonee Ponds Creek to the north and north-east, and Pascoe Vale Road to the east. 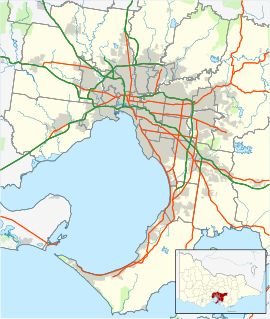 The Tullamarine Freeway divides the suburb into northern and southern halves. Strathmore Heights is a small pocket at the far north of the suburb. The first land sales in the area of Strathmore were made in 1843 and 1845 in the Parish of Doutta Galla. Major Frederick Berkley St John was the purchaser of the Strathmore North area (Section 23). The other major purchaser (Section 15, Parish of Doutta Galla) covering the Strathmore area was Edward Jones Brewster. Both made significant fortunes from land speculation. Brewster subdivided and sold 100 acres (400,000 m2) of land to Thomas Napier, who occupied the land and left a lasting legacy to the area – the origin of its name. The area of Strathmore was originally called North Essendon. The name of "Strathmore" was first suggested by the Rev. John Sinclair in 1936 and was initially adopted by the church. The name was derived from Thomas Napier's Scottish heritage, the Valley of Strathmore, Scotland close to where he once lived. The name was submitted to Essendon Council in 1943. In 1955 the Victorian Railways changed the name of the station from North Essendon to Strathmore. Strathmore Post Office opened on 1 October 1953. In 1979, Strathmore was transferred from the City of Broadmeadows to the City of Essendon. In 1994, it became apart of the City of Moonee Valley. Napier Park is a 10-acre (40,000 m²) block bounded by Woodland and Napier Streets, Noble Avenue and Glenbervie Road. It was donated to Essendon Council in 1920 by Theodore Napier, the son of Thomas Napier. It is a carefully preserved woodland block which gives visitors an idea of what the Strathmore Area was like prior to European Settlement. The park includes a stand of River Red Gums (Eucalyptus Camaldulensis). These trees are protected under the National Register of Significant Trees, and their presence is a required under the terms of the original gift. There is only one other such stand of Redgums in the Melbourne area. Lebanon Reserve is the home of the Strathmore Football Club, a member of the Essendon District Football League. This reserve is located on the banks of the Moonee Ponds Creek. Boeing Reserve is a large reserve in Strathmore Heights, with two cricket ovals, three AFL ovals and a baseball field. The reserve takes up much of the suburb of Strathmore Heights, and has a large, wooden sculpture at the south end, it also has a function centre, football/cricket/baseball clubrooms, a toilet, drinking taps, several tracks and a playground, as well as a lot of open grass areas. Other important landmarks are Essendon Airport, Moonee Ponds Creek Viaduct, Tullamarine Freeway and the Moonee Ponds Creek. Former Premier John Brumby is a resident of Strathmore. The suburb is serviced by the Strathmore railway station on the Craigieburn railway line. Cyclists have easy access to the Moonee Ponds Creek Trail along the Moonee Ponds Creek. There is also a bus line running from Airport West all the way to Essendon Station through Strathmore. The area contains several schools, including Strathmore Primary School, Strathmore North Primary, St Vincent De Paul Catholic School and Strathmore Secondary College. City of Essendon – A former Local Government Area which Strathmore was apart of. City of Broadmeadows - A former Local Government Area which Strathmore was apart of. ^ a b "2016 Census QuickStats Strathmore". Australian Bureau of Statistics. Retrieved 6 July 2018. ^ "Napier Park, Victorian Heritage Database Report". Heritage Council of Victoria.